Two out of three Far Eastern seas have vast shelf zones. 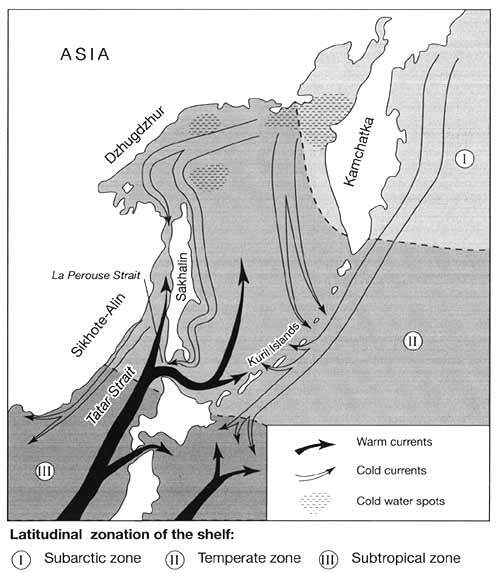 Assuming 200 m as a depth limit, the shelf comprises 46 per cent of the Bering Sea, and 41 per cent of the Sea of Okhotsk. In the Sea of Japan the shelf occupies about 23 per cent of the total territory. Two main factors exert their influence on the shelf environments: latitude and depth. In the absence of cloud cover, solar radiation received at the water surface depends on its geographical position and in the absence of marine currents the sea surface temperature is highest in the south, declining towards the North Pole. Similar to terrestrial environments, the shelf and its environmental parameters are subject to latitudinal zonality. There are ten different schemes of latitudinal zonation of the Northern Pacific of which the most general one subdivides the Northern Pacific into three zones: subarctic, temperate, and subtropical (Figure 18.1). Note that the boundaries of the oceanic latitudinal zones do not correspond to those on land. Depth exerts its influence through the absorption of solar radiation, dampening of hydrodynamic activity and reduced impact of terrestrial processes. Therefore, depth is responsible for the climatic and ecological gradients on the shelf and the formation of vertical zonality. There are three vertical belts on the Far Eastern shelf: upper (0-40 m), middle (40-100 m), and lower (100-200 m) (Petrov, 1989). Apart from these primary factors, a number of second-order factors acting on different time scales affect natural environments of the shelves and the development of marine biota, such as the interactions between the movements of the ocean plates, eustatic changes in sea level, marine currents and their changes, heat balance and evaporation, rates of sedimentation and the composition of sediments. Thus, the environments of the upper belt, including both topography and ecology, are strongly affected by wave action and sedimentation. River runoff and seasonal freezing controls water chemistry and seasonal fluctuations in salinity between 25 and 33 ppt (parts per thousand) are common in the Sea of Japan (Zhivotnye i rasteniya, 1976). Rivers are also the main source of nutrients required for the support of life. Dense large thickets of algae are typical of the upper belt. These often form a continuous belt reaching 3 km in width running along the coast. This makes navigation difficult. Over 600 species of algae are known in the Far Eastern Seas (Sukhoveeva and Sarochan, 1986). About 30 species are widespread including Ahnfeltia tobuchiensis (red algae) and Laminaria spp. (brown algae). These are commercially valuable species and the biomass of Laminaria is especially high, reaching 1000-1500 thousand tonnes or 160 kg m-2. Laminaria lives for two years and in favourable years about 80-90 per cent can be harvested without damage. In the middle belt, mechanical mixing caused by wave action diminishes and such a vital ecological factor as supply of oxygen is controlled by convective mixing. Sedimentation remains an important factor since terrestrial organic, and mineral sediments as well as biological detritus from the upper belt are partly deposited in the middle belt and partly are carried through towards the deeper parts of the sea. Due to the lack of sunlight, monocellular algae species dominate while multicellular species are few. The lower belt is located in proximity to the much more steeply inclined continental slope and enhanced water circulation results from steeper gradients. While the exchange with deep waters has an important effect on biological productivity in general, the lower belt of the shelf has poor biota in comparison with the belts positioned above. As a whole, the Far Eastern shelf is highly productive and is considered as a very rich zone in the World Ocean (Blagoderov and Markina, 1986; Markina, 1990; Shubin, 1992). The following factors contribute: intensive mixing of surface and deep waters, the convergence of warm and cold currents, high river runoff enriched by biogenic elements, and high input of the products of volcanic eruptions which have a fertilizing effect. In the Bering Sea, the surface temperatures are about 7-10°C. Because of the cool climate, the upper layers throughout the entire shelf zone are enriched with biogenic material since there is intense vertical circulation which also supplies oxygen to the deeper layers. This factor, as well as free water exchange within the Pacific and substantial biogenic input from rivers, predetermine the high biological productivity of the Bering Sea. In spring, the growth of diatoms increases its mass to 1.5 g m-3 while the mass of zooplankton in the upper 100 m layer reaches 200 mg m-3 (Bogdanov, 1981) providing an excellent food base for fish. The number of fish species in the Bering Sea exceeds 400 (Fadeev, 1986). The Sea of Okhotsk is a marginal sea of the Pacific. The water balance is maintained mainly by the exchange with the Pacific through the straits, separating the islands of the Kuril chain, while precipitation, evaporation and the exchange with the Sea of Japan are of marginal importance. The main circulation pattern is cyclonic with a number of individual cyclonic and anticyclonic gyres reaching 200 km in diameter (Figure 18.9a). The interaction of the individual gyres with islands and submarine topography forces the upwelling of cold deep waters (e.g., near lony and Yamsk islands) being, therefore, responsible for the formation of sea surface temperature patterns which in turn control the formation of persistent fogs (for which the Sea of Okhotsk is known) and patterns of biological productivity (Blagoderov and Markina, 1986). In general, the sea surface temperature reaches 10-13°C in summer but may be considerably lower in the upwelling zones. The sea is frozen between November and May and in the upwelling zones sea ice remains until the second half of June. The ice melt predetermines the low salinity of the surface waters in summer. Near the surface, water salinity is about 32 ppt increasing to 34 ppt at the bottom, which is lower than in the other marginal seas of the Pacific. The Sea of Okhotsk shelf has the highest levels of productivity (Table 18.1). High productivity of the primary phyto-plankton provides an essential nutrient supply to pelagic communities and the zooplankton biomass is substantial, reaching 5-7 per cent of the phytoplanktonic primary producers (Table 18.1). About 300 fish species are known in the Sea of Okhotsk. In its northern part, the cold-loving species of the suborders of Blennioidei and Cottoidei represents over 70 per cent. The southern part, which has a milder climate, is distinguished by higher biological diversity and the families Scorpaenidae, Pleuronectidae, and Pholidae are represented. The Sea of Japan is another marginal sea of the Pacific Ocean but in contrast to the Sea of Okhotsk it is a deep basin separated from the ocean by shallow straits. 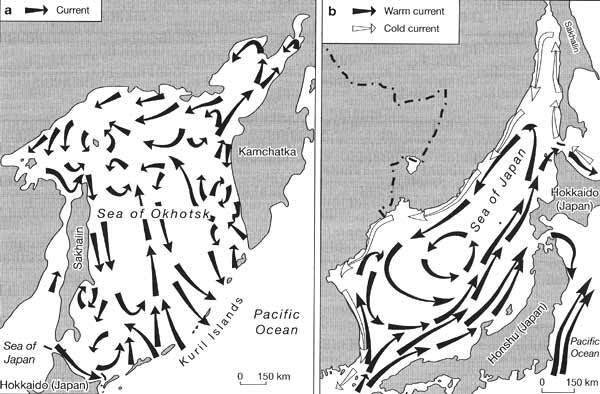 The hydrologic regime is primarily controlled by the warm Tsushima current (a branch of the Kuroshio) which enters the sea trough the Tsushima Strait in the south flowing north-eastwards (Figure 18.9b). In summer, sea surface temperatures reach 20°C, being lower in the Tatar Strait and along the western shores of Sakhalin, which are affected by the cold currents originating in the Sea of Okhotsk, and in the Peter the Great Gulf where prominent submarine ridges force the Tsushima downwards, causing the upwelling of cold deep waters. The influence of the Tsushima current is of most importance in summer while in winter the climate of the Sea of Japan is predominantly under the influence of the Asian continent and the cold currents, although it is to a degree moderated by the Tsushima, especially in the east. The distribution of salinity of the surface waters in summer correlates closely with temperature patterns: the warmest water in the southern and eastern parts of the sea is the saltiest (about 35 ppt) while in the Tatar Strait salinity drops to 32 ppt. In winter, the surface water salinity rises as a result of declining river discharge and the release of salts on freezing. The low temperature and high salinity of the surface water, which is both dense and rich in oxygen, forces mixing and provides good aeration of the deeper layers, predetermining rich plant and animal life even at great depths. In the areas where surface water and deep water rich in biogenic elements mix (e.g., in the Peter the Great Gulf), productivity is particularly high (Gavrilova and Puchkareva, 1986). The Sea of Japan has higher biological diversity than the northern seas, with 615 fish species. Boreal species of the families of Cottoidae, Agonidae, and Pleuronectidae dominate in the north while in the south many subtropical species (e.g., of the Cobiidae, Chaetontidae, and Serranidae families) are found. A few hundred fish species inhabit the Far Eastern Seas but not more than 40 species are harvested. Over the past 80 years, the harvest of fish and other marine products has increased by the factor of 30. 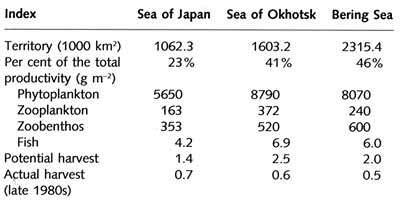 It peaked in 1975, when in the Sea of Okhotsk the total intake reached 2.8 million tonnes or 1.8 tonne km-2. The fish and crab harvests on the western Kamchatka shelf reached 13.8 tonne km-2 which is among the highest indices across the World Ocean (Blagoderov and Markina, 1986). In the early 1990s, harvests declined to 1.5 million tonnes in the Sea of Japan, 2.0 million in the Sea of Okhotsk, and 2.5 million in the Bering Sea (Markina, 1990). While there is still a potential to increase harvesting by the factor of 2 in the Sea of Japan and by the factor of 4 in the Bering Sea and the Sea of Okhotsk (Table 18.1), the most valuable species are severely overharvested. There has been a strong decline in the biomass of Pacific salmon and sardine, walleye pollack, flounder, and marine invertebrates (e.g., crabs, shrimps, and sea urchins), which have a high price on the world market, near the Kuril islands and Sakhalin partly due to the unfavourable climatic conditions in the Northern Pacific in the 1990s but also due to the excessive fishing which jeopardizes their normal reproduction (Rodin et al, 1986; Shuntov et al, 1995). Thus, decline in the population of Pacific herring is considered irreversible (Sakhalinskaya oblast: geograjicheskii ocherk, 1994). In the Peter the Great Gulf, the biomass of valuable species has declined by a factor of 2-3 (and for some species by a factor of 10) since the 1940s (Atlas podvodnyh landshaftov Yaponskogo morya, 1990). Particularly affected as a result of increasing water pollution accompanying the development of the region were oyster banks. The extremely rich banks of Patinopecten yessoensis have almost disappeared from the southern Maritime Province over the past thirty years. At the same time, many other fish and algae species, which may have commercial value, are underused. Degradation of marine biota can be combated in a number of ways. First, strict fishing quotas should be introduced and, most importantly, enforced. Another option, which has become popular over the past two decades, is sea farming. This practice involves both the protection and improvement of natural habitats and artificial cultivation of marine species (e.g., planting and breeding commercially valuable species and species that provide their food base). Sea farming is known to improve biological productivity significantly and many valuable species, such as oyster and trout, are well suited for breeding (Marikultura na Dalnem Vostoke, 1983). The establishment of marine nature reserves and national parks can help to protect marine mammals and birds. A number of parks and reserves (e.g., the Komandorskiy, Kuril, Far Eastern, and Moneron), which already exist in the region, have been very successful. However, conservation measures do not solve the problem of growing pollution for which a wider integrated system of environmental management is required. Currently, the largest Far Eastern city, Vladivostok, lacks adequate water treatment facilities. Under 10 per cent of discharge water and sewage is treated, with the rest being discharged into the sea (Dolgovremennaya programma, 1992). The discharge of nuclear wastes from submarine reactors and resulting radioactive pollution are another problem that requires action (Belozersky, 1995).